Exclusive Wooden Temples only at Naveen Arts. Buy your favourite wooden temple of your desired size and desired design. Coming in different shapes and sizes and varied Carrying capacity, Naveen Arts has the best set of these wooden temples with intricate and very sober design and structure. Buy exclusive wooden pooja Mandir online with amazing solid wooden furniture designs for home or even for temples and bring yourself a beautiful experience of having a perfect spot for pooja at home. Yes, that is what Indians live for! These exclusive wooden temples are made up of hard Sheesham wood and come with a finishing of Walnut, honey finishing and a lot more. What is even better is there happens to be zero shipping charge all over India when you buy wooden furniture online. So hurry up and order the wooden temple of your choice right away. It must be exhausting for you to hop around various stores and choose the best suited wooden pooja mandir. So forget all those tedious processes and log into the official website of Naveen Arts and go through the wide range of varieties and choose your needed one. Also, there is an option for you to go through the new arrivals and check what is new there in the market rather than wasting your time roaming around different shops. Apart from the regular ones there is another collection of Wall mounted pooja Mandirs. They are available in intricate designs and attractive prices. No worries of changing the mandir’s location from time to time while cleaning; it is easy to use and also perfect for your modern styled home. And no trouble of fixing it, there will be people assigned from Naveen Arts who will come and fix it for you. Thus, you will meet your ends with just a click in your phone or desktop. 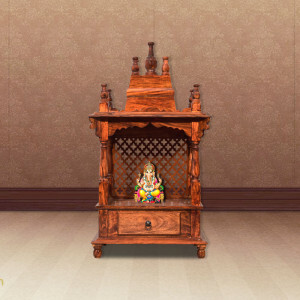 Thus, log into www.naveenarts.com and get indulged into the wide range of varieties provided by them and make the purchase of wooden pooja Mandir for home online, easy and best for you.